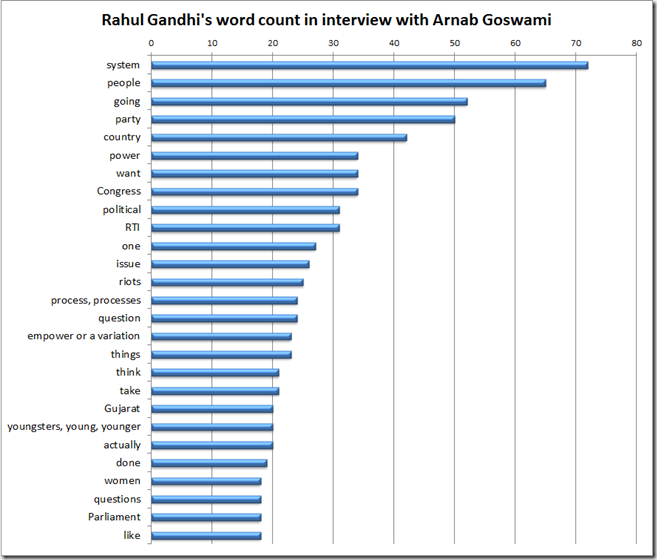 So apparently the Rahul Gandhi interview has broken all social media records (2.5 lakh tweets, 50 Cr impressions, 8 of 10 top trending on Twitter related to interview, highest searched interview on Google). 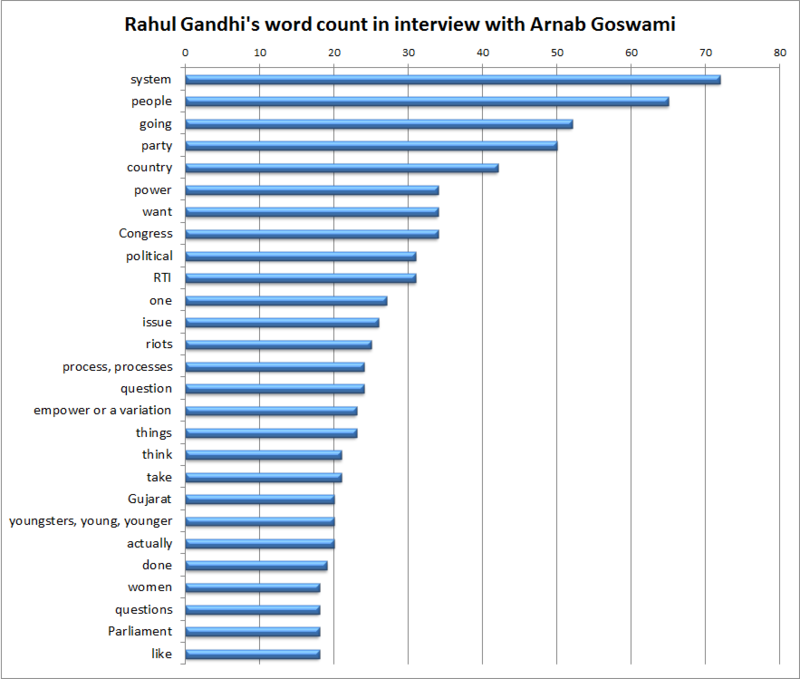 Wow, so Raga is a clear winner (at least here). This guy managed to out speak ‘Mr. Argo’, which is a national challenge in itself (he must certainly count this an achievement in his next interview). Talking about Raga’s plan for the future, his favorite words are – Change (15 times), System (72 times), Empower (23 times) and women (18 times). The graph below clearly shows that “system” is THE word, topping the list. Women and Youngsters combined make the 6th most popular words! If you ask me, which state in India he loves the most, the answer would be ‘Gujarat’ as he mentions Gujarat once every 4 mins (on an average) through the complete length of interview. The next milestone for Mr. Raga seems to be “Change the System” ! The phrase appears in its different forms exactly 9 times! I wonder, the person who is so desperate to talk about changing the system (9 times in 1hr 20 mins), how much he would have actually changed the system in last 10 years! Raga’s dictionary of words (in order of their usage) : System, People, Country, Congress, RTI, Process, Empower, Gujarat, Youngsters, and Women. Jairam Ramesh and Priyanka Gandhi, who were prompting Raga during the interview, seem to have done a good job. 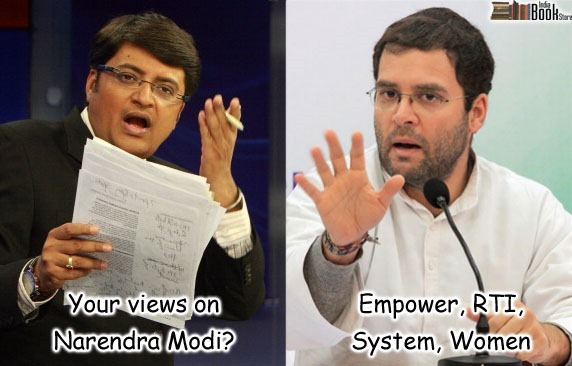 And so has Raga, by memorizing all the buzzwords, a little TOO well, perhaps! The country would have been more content learning some actual facts about their prospective PM candidate’s future plans. Nonetheless, speaking something is better than not speaking at all, if you know what I mean. Well considering that he is being projected as a PM candidate from Congress, this was a complete disaster! Fumbles and all happen to everybody, but speaking like reciting essays, using illeism, and changing gears…even wikipedia added him to their list of people using illeism!! have some mercy on the poor boy 🙂 I developed some sympathy for him post that interview. He has succeeded in starting a sympathy wave. Congress party message is that we have been treating the people like Ch003yaas so now we want to project a leader who sounds and acts like a maha Ch003ya just so the voters could identify with him.